Monty's Beers were brewed with taste, flavour and satisfaction in mind. For a meal to match your favourite pint, look below for some of great food ideas to keep your pint company! This is a hearty dish made special with the addition of rarebit croutons. • Preheat the oven to gas mark 2 / 150°C / 300°F. • Mix the mustard and flour together and then coat the beef with it. Heat 1 tablespoon of oil in a frying pan and cook the onions for about 5 mins, stir in the carrots and cook for another 5 mins. • Place the vegetables in a casserole. • Add the remaining oil to the pan and brown the meat, then add to the casserole. • De-glaze the pan with the beer scraping all the sediment off the bottom and pour over the meat along with the stock, bay leaf, sugar and seasoning. Cover and cook in the oven for 2½ - 3 hours. • Preheat the grill, toast the bread on one side then sprinkle the other side with the cheese and grill until the cheese begins to melt and bubbles. 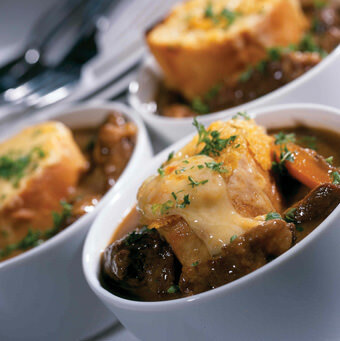 • Once the casserole is cooked place the rarebit croutons on top of the meat and serve immediately. A flat fish with a succulent, slightly sweet flesh which is ideal for this recipe. • Heat the sunflower oil in a large pan. Meanwhile place the flour in a large mixing bowl and season with the Sea Salt. Add the beer or water and mix well until you have a smooth batter, it should be the consistency of double cream. • Coat the fish in the batter and cook in the hot oil until golden and crisp. Be careful not to over crowd the pan. Remove with a slotted spoon and drain on kitchen paper. Keep warm. • Cook the peas and mint leaves in boiling water for 2 minutes and drain. Add a knob of butter and season well. Blend to a smooth puree and stir in the crème fraîche. • Serve with the potato wedges which have been coated in the rapeseed oil and roasted in a moderate oven for 20-25 minutes. An ideal starter! Prepare the rarebit mixture in advance and chill until required. • Pre-heat the oven to 200°C/Gas mark 6. • Prepare the mushrooms, wipe with damp kitchen towel and remove the centre stalk. Place the mushrooms, olive oil and garlic in an oven proof dish and leave to marinade for 30 minutes. • Make a roux with the flour and butter and cook over a low heat for 30 seconds. Remove from the heat and whisk in the milk and beer – Monty’s Brewery. Stir over a low heat until mixture reaches boiling point, reduce heat and simmer for 2 minutes. Allow to cool slightly. • Add the mustard and most of the cheese and mix well. Season with salt and pepper. • Meanwhile roast the mushrooms for about 10 minutes until beginning to soften. Remove from the oven and top with the rarebit topping, sprinkling over the remaining cheese. • Heat the grill to medium setting and grill until golden brown. Serve with a dressed rocket salad. Venison is a lean red meat, low in fat and cholesterol and full of flavour which is available all year round. • Preheat the oven to 150°C/Gas Mark 4. • Toss the venison in the seasoned flour to coat. Heat the oil in a heavy based pan and fry the shallots and mushrooms until beginning to soften, transfer to a bowl. • Add a little more oil to the pan and fry the venison in batches until lightly coloured. Remove to a bowl. Fry the bacon until golden and then return the venison and vegetables. • Add the ale, stock, juniper berries and herbs and bring to the boil, cover and place in the oven for 1½ hours until the venison is tender. Using a slotted spoon divide the meat between 4 pie dishes. Discard the herbs and boil the liquor until it has reduced to a thick consistency. • Pre heat the oven to 200°C/Gas Mark 6. • Cut the pastry to fit the pie dishes. Brush the rims of the dishes with water and lay the pastry over the filling. Brush with egg glaze and sprinkle with Sea salt if you wish. Bake for 25 minutes until golden and puffed. If you have a favourite Monty's Beer recipe you would like to share with us let us know via our contact page, we'd love to hear it.